With the help of Half-Life 2 veteran Viktor Antonov, Arkane Studios is crafting a stark and striking "neo-Victorian" visual style for its upcoming game Dishonored. I was excited about Dishonored from the moment I heard about it, solely for the fact that it's being made by Arkane Studios, the team responsible for Arx Fatalis and Dark Messiah of Might and Magic. Both games were outstanding efforts, particularly Arx, yet neither were rewarded with particularly noteworthy sales. But Arkane held together and now, under the auspices of its new owners at ZeniMax, it's hard at work on yet another new game. Starting with a fictional Anglo-Saxon country in 1666, the game world was brought forward to the present and the future to become "pure science fiction," Antonov explains in a new Game Informer video. Inspiration for the game's bold look came not from other videogames, which he stayed away from in order to avoid being influenced by sequels and known IPs, but from paintings, sculptures and photographs from different eras and illustrators. Antonov said he tried to avoid injecting any Half-Life 2 into the game, despite Arkane's request that he do so, but he acknowledged that "maybe some of the machines go in that dark, industrial style that I usually do." I think it's fair to say, looking at the images in these videos, that there's no "maybe" about it. The vehicles and architecture give off a distinct Combine/City 17 vibe, but not a distracting one. I'd go so far as to say that at this early stage, things are looking pretty hot indeed. 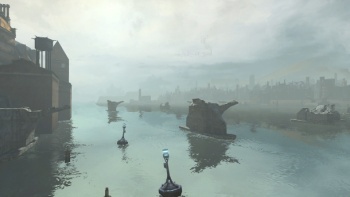 Dishonored is currently in development for the PC, Xbox 360 and PlayStation 3, and is scheduled for launch in mid-2012.